The Eunice Waymon-Nina Simone Project announces that Philadelphia-based sculptor Zenos Frudakis has accepted the commission to create a bronze sculpture of Nina Simone. Frudakis’s work appears in numerous private, corporate, university and government art collections both in the US and abroad, including the Pentagon, the National Academy of Design and the Nobel Foundation. He excels at expressing the character and vitality of his subjects while capturing an accurate likeness. Notable commissions include the Honor Guard at the National Air Force Memorial in Arlington National Cemetery, Freedom at the GSK World Headquarters in Philadelphia, PA, Martin Luther King at the US Embassy in Pretoria, South Africa, and sport figures Joe DiMaggio, Steve Carlton, Arnold Palmer, and Payne Stewart. North Carolina boasts several of Frudakis’s works already. Notable among them are Payne Stewart, Robert Dedman and Richard Tufts in the Village of Pinehurst. Other works are located in South Carolina’s Brookgreen Garden and Georgia’s Capitol and Golf Hall of Fame. World-renowned singer, songwriter and social rights activist Nina Simone would have been seventy-five years old today. Born Eunice Kathleen Waymon at 30 East Livingston Street in 1933, the native Tryon daughter came to achieve international prominence for her sultry renditions of jazz and pop standards and her outspoken support for equal rights. Efforts to memorialize Nina Simone in Tryon are well underway. 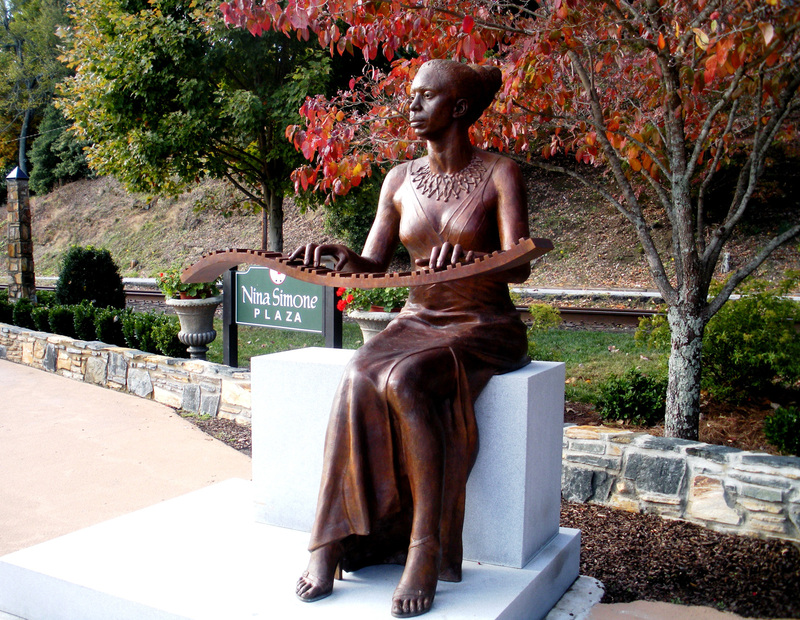 The Eunice Waymon-Nina Simone Memorial Project presently sponsors two annual scholarships, and donations are being solicited for a life-sized bronze sculpture of Simone by Zenos Frudakis, who visited Tryon in mid-January to explore potential site locations for that sculpture. More recently, Frudakis and Nina Simone Project director Dr. Crys Armbrust met with Simone’s daughter Lisa Simone Kelly after her concert at the World Café Live in Philadelphia. Her sold-out performance, accompanied by a seven-piece jazz ensemble, evoked the memory of her famed mother and echoed many of the tunes that had made Nina Simone famous. It is an understatement to say that the audience wholly approved. “Zenos, I think what you are doing is amazing!